Percentage of population with access to safe water: 83 percent. Between a quarter and a third of China’s population doesn’t have piped water. By one count 48 million people in China lack sufficient drinking water. The number of people facing severe drinking water shortages doubled to 5.9 million in early 2008 because of a severe winter drought. China has more than a fifth of the world’s population but only 7 percent of its fresh water. On top of that the North China Plain is home to about 42 percent of China’s population but only has 8 percent of the country’s water resources. If the region where a country its water availability would rank below Morocco. It is estimated that China will need to increase its water supply fivefold to meet its industrial needs by 2035. An blunt editorial The South China Morning Post said that China, had mismanaged its vast system of 87,000 reservoirs, 43 percent of which it said were in poor condition. There is an old Chinese saying that when noble guests visit the streets must be sprinkled with water. Water use per person (personal, agricultural and industrial): 116,000 gallons, compared to 484,500 gallons in the United States. About half of China’s water is used for irrigation. This figure may rise to 70 percent by the next century. By various accounts 97 percent or rural people lack adequate sanitation and 360 million rural people lack access to safe drinking water. Many more villages have access to electricity than running water. Outhouses and fields are what people use in villages not flush toilets. Running hot water is often considered a luxury that only the Chinese elite can afford. 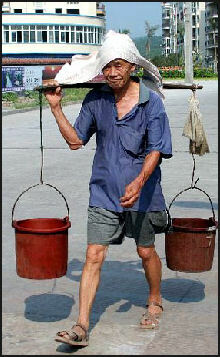 The amount of water available for each person in China is about one quarter of the world average and is declining. The problem is particularly acute in years when there are severe droughts. At least 300 cities are experiencing water shortages. The tap water in Beijing often has a funny smell and lots of particles in it. China supports 20 percent of the world population with only 7 percent of is water. China has roughly the same amount of water as the United States but five time the population. The shortages are particularly acute in northern China where half the population lives with only 15 percent of China’s water. Generally, southern China is relatively wet and northern China is largely dry. In southern China many people get their drinking water from ponds and lakes. Expert: Ma Jun director of Institute of Public and Environmental Affairs and author of China’s Water Crisis . Reports: The U.N. World Water Development Report 2009 by UNESCO; and Asia’s Next Challenge: Securing the Region’s Water Future . Access to water supplies has produce conflicts between downstream communities and up stream ones, farmers and factories and environmentalist and economic planners and even different cites. Many farmers have had their water supplies diverted for industrial use. One farmer who used to grow 35 bushels of wheat a year told the Washington Post that he stopped raising wheat when water was directed from a local river to a petrochemical plant. He said he now has trouble supplying enough drinking water to his family and has to use a well dug over 100 meters and shares it with other families to get the water. In Beijing, because the water levels in the Minyun reservoir are too low and the water in the Guanting reservoir is too polluted to drink, water was has been diverted from a river than normally supplies water ro Tianjin, depriving that city of badly need water supplies. Even with that there isn’t enough water for Beijing. Beijing now gets three quarters of its water from underground aquifers, with drilling reaching to depths of 3000 meters, five times deeper than in the 1990s. 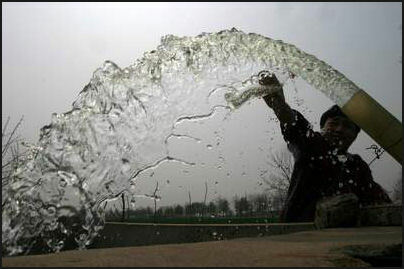 Water shortages in Beijing were deemed so critical in the summer pf 2010 that the authorities announced the diversion of 200 million cubic meters of water from Hebei's farmfields to quench Beijing's thirst. “North China is chronically short of water and subject to frequent droughts. A considerable proportion of its irrigation water comes from wells. Officials in the Ministry of Water Resources and Electric Power (and its predecessors) have periodically proposed diverting water from the Yangtze to irrigate the North China Plain. Farmers have also been encouraged to use sprinkler systems, a more efficient use of scarce water resources than flood-type irrigation systems. Water problems in northern China aline include chronic droughts is ravaging farmland; the movement of the Gobi Desert eastward and southwater. The Yellow River, the so-called birthplace of Chinese civilization, is so polluted it can no longer supply drinking water. The rapid growth of megacities---22 million people in Beijing and 12 million in Tianjin alone---has drained underground aquifers that took millenniums to fill. In December 2010, China said it would invest $30 billion in water-saving projects in 2011 with the primary ai being to reduce the impact of drought, flooding and other natural disasters in grain production. The decision comes on the heels of severe droughts and flooding driving u food prices and fueling inflation and social discontent. The project’s official Web site says that the diversion “will be an important and basic facility for mitigating the existing crisis of water resources in north China” and that sufficient studies have been done. Wang Jian, a former environmental and water management official with the Beijing government and the State Council, China’s cabinet, agreed that the project “carries huge risks,” but he said there were no other options given the severity of the current water shortage. The middle route is to start major operations in 2014, and the eastern route is expected to be operational by 2013. The lines were originally supposed to open by the 2008 Summer Olympics, but have been hobbled by myriad problems. The western route, which would run at an average altitude of 10,000 to 13,000 feet across the Tibetan plateau to help irrigate the Yellow River basin, has been deemed too difficult to start for now. Only a fraction of one percent of the world’s water is available for drinking, bathing, agriculture and industry. About 96.5 percent of the world’s water is salt water in seas and oceans. Another once percent is salt water in lakes and brackish and salty groundwater. That means only 2.5 percent of the world’s water is fresh water. About 70 percent of the this is frozen in polar ice sheets and glaciers and around 29.5 percent is in deep, hard-to-reach aquifers. Lakes and rivers contain just slightly more than one forth of a percent of all freshwater. Soils and wetlands, plants and animals contain less than a tenth of a percent. Clouds and atmospheric water vapor contain less than four one-hundredths of a percent. Much of the freshwater that is available flows into the seas are ends in places that people don’t need it, such as in Canada and Siberia. Worldwide water use: 1) agriculture (70 percent); 2) industry (20 percent); and 3) domestic uses such as drinking, washing and flushing toilets (10 percent). Water has traditionally been a source of power and wealth in the developing countries. Powerful people often controlled wells and irrigation water. Well water is much safer than pond or even river water. The ground the water passes through helps filter out germs and impurities. Some villagers complain that it tasteless and say they prefer pond water. Even when a well is ready to use villagers are reluctant to use it. Ponds are used for rasing fishing and supplying drinking water for animals and irrigation water for crops. City water in some urban areas Aquifers are underground layers of porous rock that contain water. 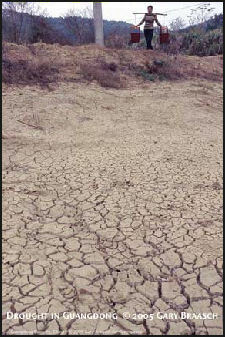 Shallow aquifers can be replenished by rain. Deep aquifers can not be quickly replenished. By some estimates there is a 100 times more underground water than there is surface water in lakes and rivers---enough to support billions of people for centuries. Much of the world’s water is at depths of one kilometer or more---too deep to be extracted economically. Drawing too much from shallow aquifers caused environmental damage. Once the water is gone it takes a long time for it be replenished. Only 10 percent of water worldwide is consumed for personal uses such as drinking, bathing and washing clothes and dishes. Each person needs about 48 liters (13 gallons of water) a day for drinking, cooking and sanitation. Even so, a sixth of world’s population gets by on less than that. Americans use an average of 400 liters of water per person per day. A lot this is water used for thing like irrigation and industry not just taking showers, washing cars and flushing toilets. Most homes in the developing world don't have running water or toilets. In rural areas, water is often fetched and carried from wells and streams or even ponds. Urban poor get their water from community spigots. The water is often of dubious quality and dirty enough to make those who drink it get sick. Rural people are very good at bathing in streams and rivers without removing their clothes. In past villagers had to walk long distances to well. Today, deep-boring machinery introduced by aid workers has enabled villages to have their own wells. Village well A tube well is type of well comprised of a relatively narrow cylinders sunk into the ground and a hand pump above ground. It taps into clean groundwater or natural aquifers. Tube wells can be dug very deep using technology similar to that used in the oil industry. There is a concern that uncontrolled tube well use might lead to a water crisis. In some places farmers using tube wells with electric pumps are sucking up groundwater reserves much faster than can be replenished. Tens of thousands of these wells have been dug, often beyond official control. The problem is particularly acute in places where there is relatively little water and a particularly high number of people. 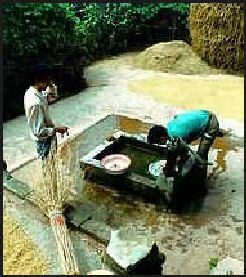 In some cases the water is wasted nourishing water-thirsty crops like alfalfa, rice and sugar cane. Water shortages The main problems with water are shortages of water, shortages of clean water and waterborne diseases. Around 80 percent of all deaths from illness in the developing world are caused by lack of access to safe water. More than 5 million people die each year from water-related diseases such as severe diarrhea, hepatitis A and dysentery. Every week it seems there are alarming predictions about water: disease, starvation, crop disasters, famines, war. One of the major challenge in many developing countries is to provide decent drinking water and sanitation to sprawling shanty towns and areas occupied by the urban poor in the cities. In rural area at least the poor can dig wells and take care of the sanitation in their fields. Water is wasted because of bad drainage, water pipes that leak, evaporation from reservoirs and canals, poor irrigation and industrial practices, and lack of wastewater and drinking water treatment.